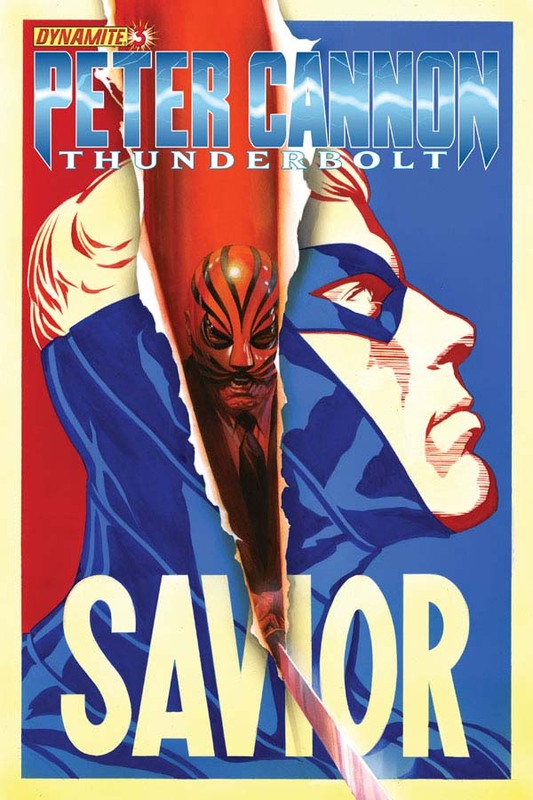 The Fellowship was fortunate enough to obtain a copy of PETER CANNON: THUNDERBOLT #3 from Dynamite Entertainment. The story is by Steve Darnall & Alex Ross with art Jonathan Lau and colors by Vinicius Andrade. A captured Thunderbolt meets the man responsible for his predicament - the Master Tiger. He feels that Cannon’s motives are selfish and vain, while revealing his own motives and his life story. Tiger intends to kill Thunderbolt in combat, but he himself is defeated. Cannon escapes and goes home. Meanwhile, a meeting is being held on how to handle The Dragon. Who are these men and is Thunderbolt to be a part of their plans? And who is mysterious figure that Master Tiger is conversing with after Cannon’s escape? I’m familiar with Thunderbolt, but know so little about him so if this series is a departure for the character I am unaware. I first came across Jonathan Lau’s art with THE BIONIC MAN series and totally enjoyed it. His work on this book is no less impressive. This is an intriguing start to a series and I want to see where things go from here. PETER CANNON: THUNDERBOLT #3 is in stores now and available at www.dynamite.net.